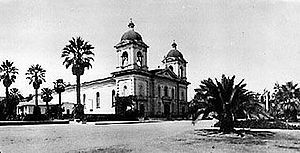 Wikimedia Commons has media related to Mission Santa Clara de Asís. USNS Mission Santa Clara (AO-132) – a Buenaventura Class fleet oiler built during World War II. ^ a b Ruscin, p. 196. ^ Leffingwell, p. 137. Though Serra is generally credited with the Mission's founding, it was Father Tomás de la Peña who actually celebrated the first mass at the site. ^ a b c Krell, p. 315: as of December 31, 1832; information adapted from Engelhardt's Missions and Missionaries of California. 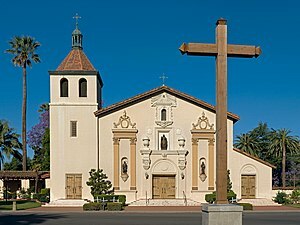 Mission Santa Clara witnessed the greatest number of baptisms, marriages, and burials of any settlement in the Alta California chain. ^ Krell, p. 315: as of December 31, 1832; information adapted from Engelhardt's Missions and Missionaries of California. ^ Shannon E. Clark, The Alameda: The Beautiful Way, San Jose: Alameda Business Association, 2006, ISBN 978-1-4243-1868-1, p. 2. ^ University, Santa Clara. 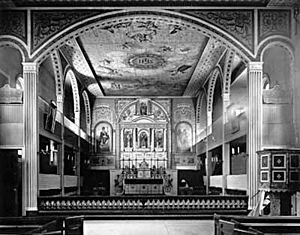 "Mission Santa Clara de Asís – Santa Clara University". ^ Fodor's (December 21, 2010). Fodor's Northern California 2011: With Napa, Sonoma, Yosemite, San Francisco & Lake Tahoe. Random House Digital, Inc. p. 48. ISBN 978-1-4000-0503-1. Retrieved December 25, 2011. ^ "Mission Church Bell Tower". Mission Santa Clara Unearthed. Santa Clara University. Retrieved January 9, 2019. ^ Pugh, Teresa (2006). "History of Mission Santa Clara de Asis". Santa Clara University. Retrieved June 8, 2013. ^ Kimbro, Edna; Costello, Julia G.; Ball, Tevvy (October 20, 2009). The California Missions: History, Art and Preservation. Getty Conservation Institute. ISBN 0-89236-983-3. ^ Lichtenstein, Bea (2005). "Images of America Series". Cemeteries of Santa Clara. Mount Pleasant, South Carolina: Arcadia Publishing. ISBN 9780738530130. Giglio, Gary, C., et al. Environmental Impact Report for the General Plan Amendment, Rezoning and Development of a Portion of FMC Corporation's Coleman Avenue Facility, Earth Metrics Inc., September 1988, published by the City of Santa Clara, California. Levy, Richard. (1978). William C. sturrent , and Robert F. Heizer, ed. Handbook of North American Indians. 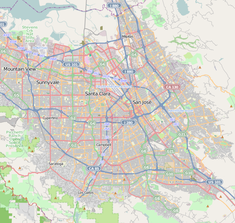 8 (California). Smithsonian Institution, Washington, DC. p. 486. ISBN 0-87474-188-2. Howser, Huell (December 8, 2000). "California Missions (106)". California Missions. Chapman University Huell Howser Archive.